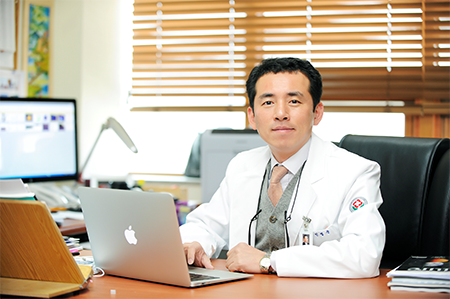 The Institute for Molecular Imaging and Theranostics (iMIT) at Chonnam National University brings together scientists and physicians who share a common interest in developing and using state-of-the-art imaging technology and developing innovative technologies and science in the field of molecular theranostics. Research programs, linked by molecular imaging, microbiology, synthetic & systems biology, nanotechnology, chemistry, engineering and physics provide the chances to perform integrated science in an interdisciplinary setting. With an initial focus on cancer therapeutics and immunity, we pursue new technologies to visualize, measure, and treat cancers using diverse biological molecules and organisms. Through genetic engineering, synthetic & systems biology and molecular imaging, we can develop smart drugs for novel type of cancer immunotherapy that allows us to visually observe the therapeutic process non-invasively. Based on this, our interests are now expanding to other fields such as infection, cardiovascular/neurological diseases, and pain science based on diverse multimodal imaging technologies. The ultimate goal of iMIT is to provide medical technologies with new science to maintain the health, identify the early transformation of disease and cure them most effectively as part of new era in precision medicine.